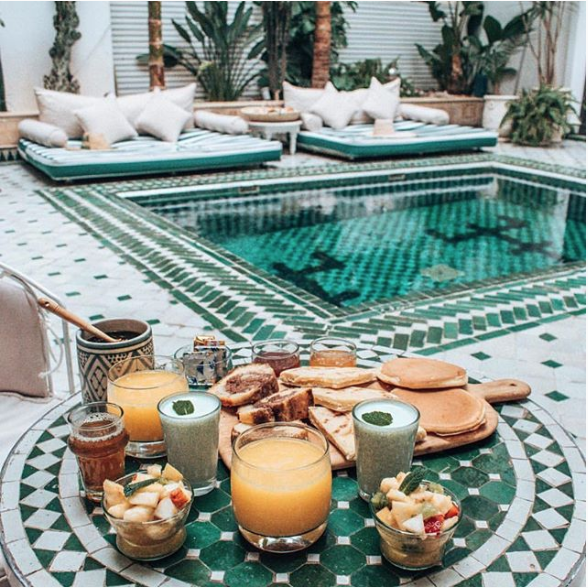 Riad Yasmine is pretty much a dream destination. 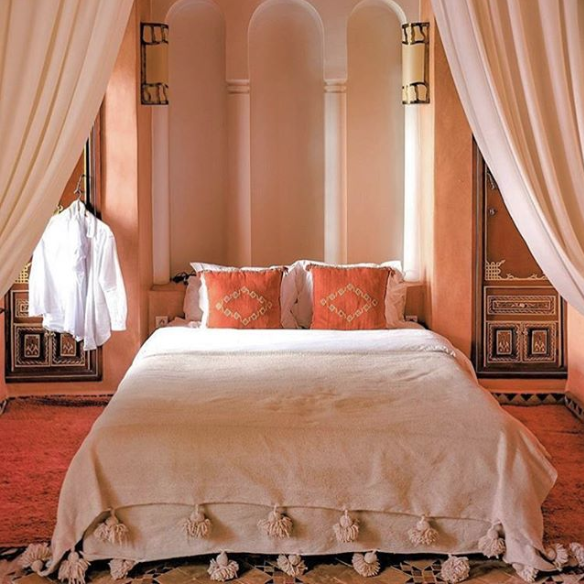 The eight-bedroom hotel is located in Marrakesh and run by a couple named Alice and Gabriel, AKA a "private house run by two lovers." Swoon. The two were living in France before picking up their life and heading to Morroco to take over the business that is now their extremely gorgeous hotel. Besides being an ideal getaway location thanks to its serenity and somewhat magical design aesthetic, Alice and Gabriel also encourage that guests get to know one another and leave as friends at the end of their experience there. I caught up with Alice about how all of this came to be. You guys originally came from the south of France, how did you end up in Marrakech? 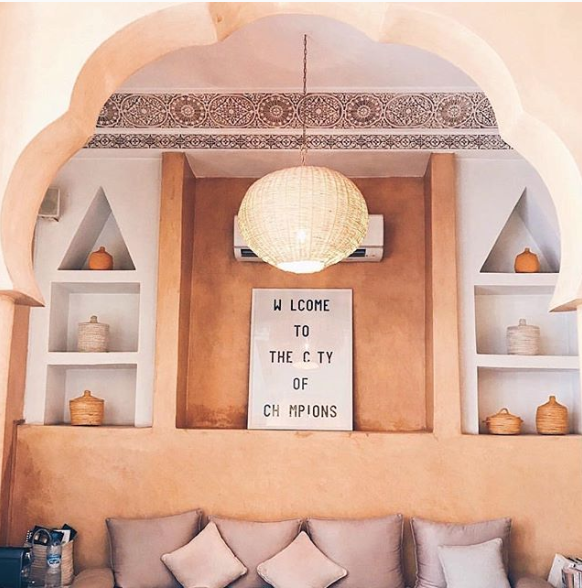 Did you move for Riad Yasmine or did that opportunity arise once you were living there? Gabriel and I have been a couple for 12 years, we're travel lovers and always looking for new adventures. 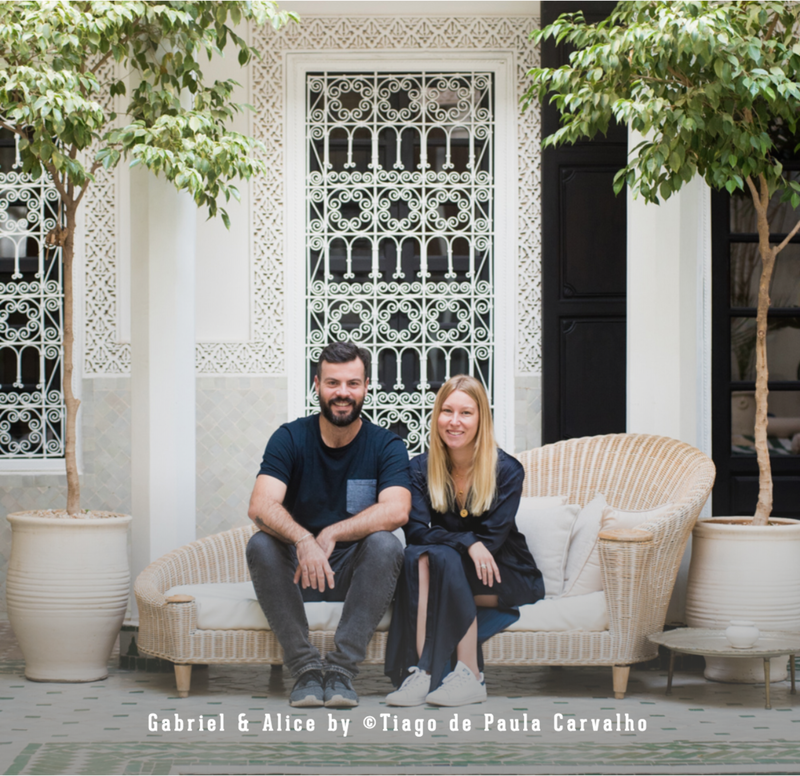 Our original project was to open a guesthouse in Asia but we had this beautiful opportunity in Marrakech as Riad Yasmine's owner is Gabriel's father. In 2015, he decided to sell the Riad and we took the opportunity to keep Riad Yasmine into the family and Gabriel and I continue to run the guesthouse. Before that, I was working in communication and also worked in the travel industry. Gabriel is a chameleon, he was a photographer, pizzaiolo, commercial in the coffee industry...we have both very different backgrounds and that is what makes us complimentary. I'd love to hear about the process of coming in and taking over the existing property. What did you end up renovating? What elements did you keep? Within three years the Riad has changed so much, when I look at the pictures when we first arrived, I can barely recognize it! The building itself has not been touched, but we did the decoration and changed almost everything little by little. Starting with the rooms, living rooms, patio...then the rooftop. It went very smoothly, step by step. We always are trying to improve and keep continue to change decoration etc.. The design and green elements of Riad Yasmine look so gorgeous. I'm sure Marrakech is quite inspirational, are most of the goods local? Yes our inspiration comes from Morocco and we try to work the most we can with local artisans, it's really important to us. How about the food you serve. Who is your cook? Any must-have meal you'd suggest a guest try during their stay? Ibtissem has been our chef for 2 years, she cooks everyday homemade breakfast and can serve dinner and lunch on request. She cooks mostly Moroccan food but as we have more and more requests for vegetarian options, we try to offer different options. Her chicken tajine with lemon is olives is a must to try while visiting the riad. Tell me about the desire that your guests leave as friends. Is there generally a social element to the stay? Have you made interesting connections with guests? Do people tend to return? Yes, for almost 3 years now, we have met so many inspiring and interesting people coming from all over the world. We have people that come back and we also made a lot of great connections and friends. Instagram is a great way to keep in contact with people. We also meet a lot of people in their own country while traveling, it's amazing! We have bought a new riad, right next to Riad Yasmine, it will be called "Le Petit Yasmine", a 3 bedrooms riad that will be rented in its entirety. It will be more private, hight standing, we are actually doing renovations and are very excited to see it finished hopefully before the end of 2018. Riad Yasmine can be found on Instagram.